tower wrote: I'm glad something is getting done, but it's a shame to see them backing down from the original vision. Does anyone know if these will be buffered or not? I counted and a rider going NB from 20th to 5th can expect the lane setup to change 20 times in 15 blocks. In some places the design changes twice in the same block. It's certainly better but the city came up with a plan that's going to get complaints almost immediately. My favorite is in some blocks cars cross the bike lane before the corner and turn right from the right of the bike lane but on some they turn right from the left of the bike lane. That's going to create so many problems as drivers try to figure out where to go to turn. Consistency would help a lot here. NKC is laying a cycle track in the development area where the mill used to be. 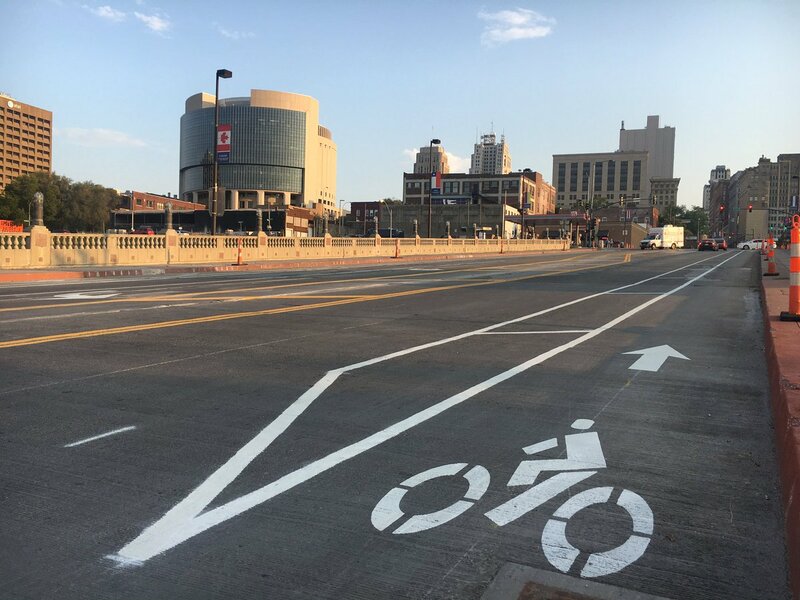 As part of NKC’s redevelopment plan for Armor they are putting in bike lanes and stuff, but is there any interest in also putting in a streetcar? Yep! There are thinking about making putting another cycletrack on Burlington Street/MO-9, and the renders show a streetcar. But they probably want KCMO and the state to be involved so that they can run it over the HOA bridge and connect it to the current system in some way. The meeting over the cycletrack happened, but they defferred the vote. They are waiting to hear feedback from the state. ldai_phs wrote: but is there any interest in also putting in a streetcar? The 2014 studies looked at Burlington, Swift and Armour. They identified they can't go past the I-35 bridge without raising it up with a major interstate project. Armour can't be lowered due to belowground utilities. Without getting to NKC hospital putting the money into going north into KCMO provides much more value. Which of course hits another too short bridge at I-29. And given that intersection needs way more work if the city is going to push on one rework project it should be that one. Come celebrate the completion of 1/4 of the downtown bike loop project a half decade late. 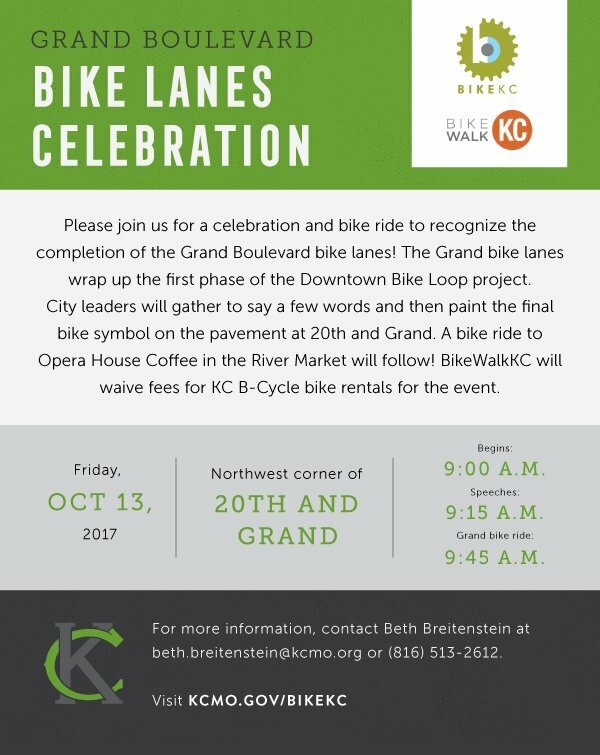 smh wrote: Come celebrate the completion of 1/4 of the downtown bike loop project a half decade late. ...and bring your best civic attitude! Grand looks pretty damn good. I'm excited to see the rest of the loop finished. Driving grand yesterday was great. Traffic moved at a reasonable and safe speed, but was still just as efficient as before. 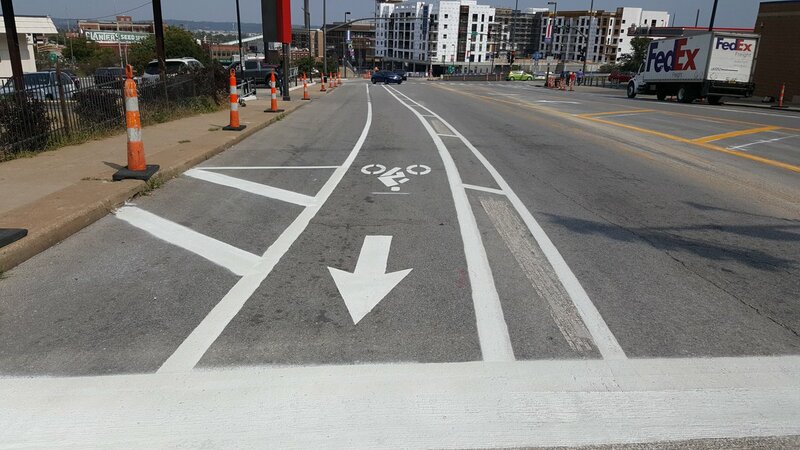 As soon as I got to the end of the painted bike lanes on grand I found myself naturally gunning back to 40 and racing to the next stop light. You'd think crown center would want traffic calming bike lanes to continue through their pedestrian oriented plaza instead of the raceway cluster they have now. All in all the bike lanes make a huge difference that seems to be a net positive for all modes. I really wish grand continued instead of connecting with Main St.
beautyfromashes wrote: I really wish grand continued instead of connecting with Main St.
Grand was functionally truncated in 1857 when Union Cemetary was founded. The city didn't go south of 9th St until two years after the cemetery was founded. Keep in mind that until 1910, the Cemetery went all the way to Main. kboish wrote: Driving grand yesterday was great. Traffic moved at a reasonable and safe speed, but was still just as efficient as before. As soon as I got to the end of the painted bike lanes on grand I found myself naturally gunning back to 40 and racing to the next stop light. You'd think crown center would want traffic calming bike lanes to continue through their pedestrian oriented plaza instead of the raceway cluster they have now. 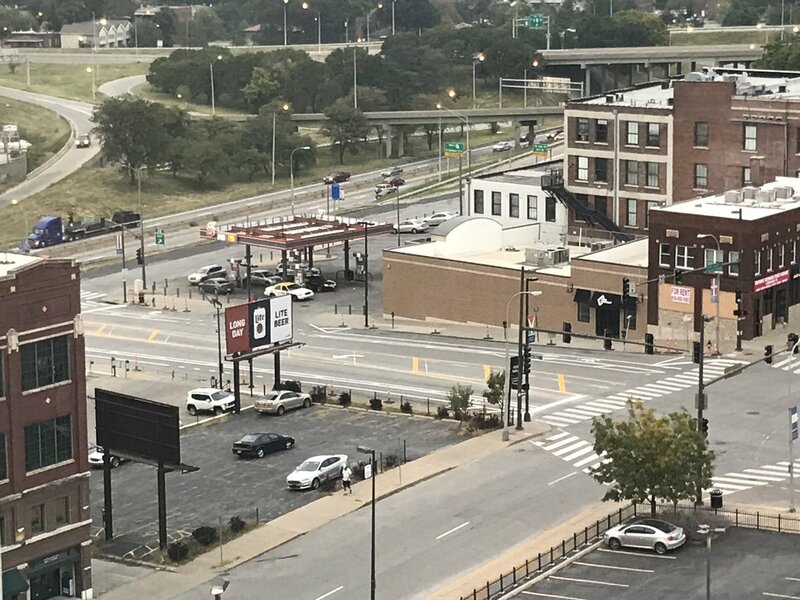 The first evening rush hour after completion last week was terrible northbound, mostly due to drivers unexpectedly finding themselves stuck in a new right-turn-only lane. It looks like people have acclimated quickly though, it hasn't been bad any of the times I've gone that way since then. From what I can tell, most of the times things get backed up is when a delivery truck or car decides they are just going to stop wherever they damn well please so they can run into a building quickly or pick someone/something up. This, however is a problem on nearly every DT street right now. Heading west on 11th street at rush hour is like running a slalom course. Its super dangerous and unnecessarily slow and congested as cars weave around illegally parked cars, construction, and delivery vehicles. No one obeys the traffic rules. Probably because no one enforces them. The same goes for east on 12th; it's effectively down to one lane between Main and Walnut due to a) the never-ending facade work at Andrews McMeel Universal and b) the likelihood of someone illegally parked in front of the T-Mobile store is just short of 100%.